One of Oscar’s favorite things in life is a warm blanket. We learned this one night when Oscar’s blankets finished drying right before his bedtime, so I took one straight out of the dryer and put it in his crate. Oscar went immediately into his crate, plopped down on the warm blanket, and went to sleep. Now, anytime we switch out Oscar’s bedding with clean blankets, we heat them up first. He always snuggles right into them, looking happy and content. Oscar cozy in a blanket right out of the dryer. 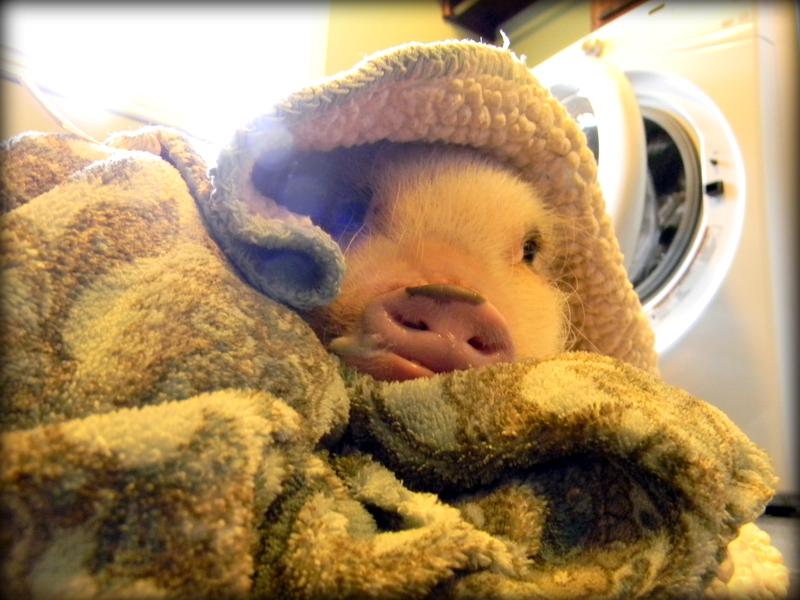 If you have a new piglet still adjusting to home, try heating up a blanket or towel for your pig. 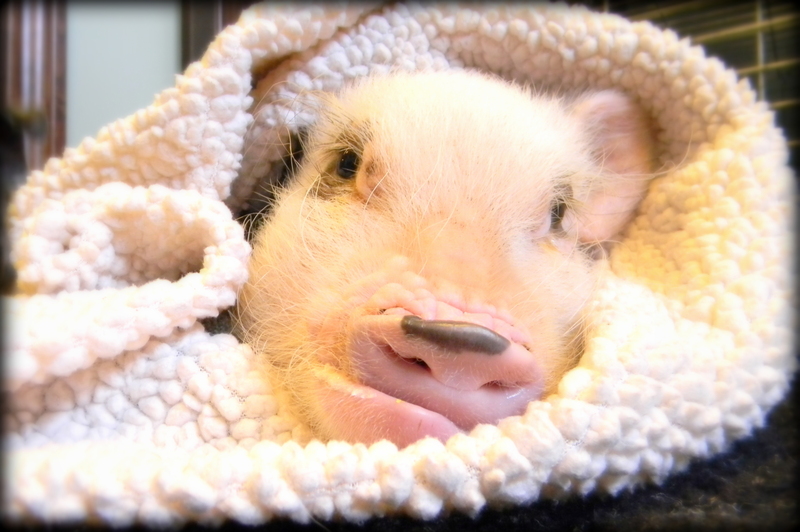 Mini pigs love heat, and the warm blanket might help her settle down and feel more comfortable in her new space. 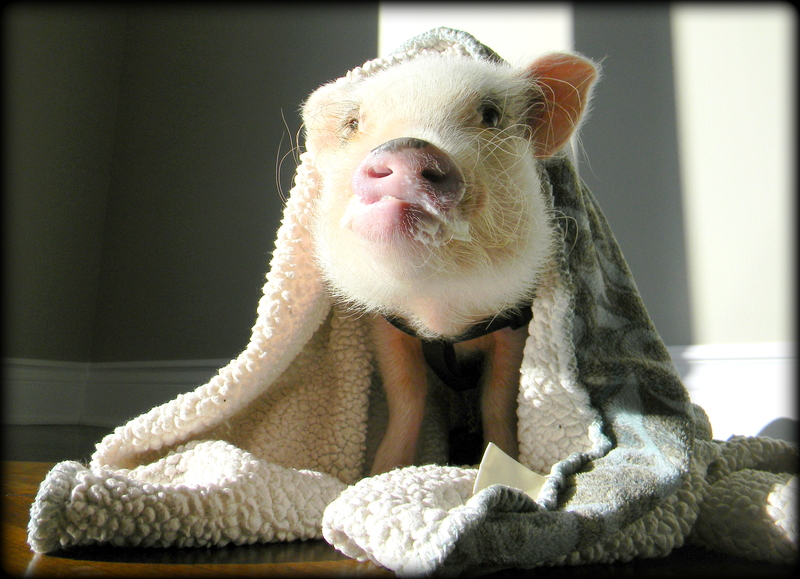 Of course, always feel the blanket first to make sure it’s not too hot for your mini pig, but otherwise you can leave it in her room or wrap her in it if she’ll allow you to cuddle with her. If you’re struggling to bond with your mini pig, the warm blanket might help her feel safe and more trusting, important elements for building a strong bond with your pig. Oscar wrapped in a warm blanket on his way to bed. That’s one nice looking arm. You’re a lucky piglet, Oscar. I just LOVE Oscar and your blog! I’m so happy I stumbled upon it and look forward to every entry! 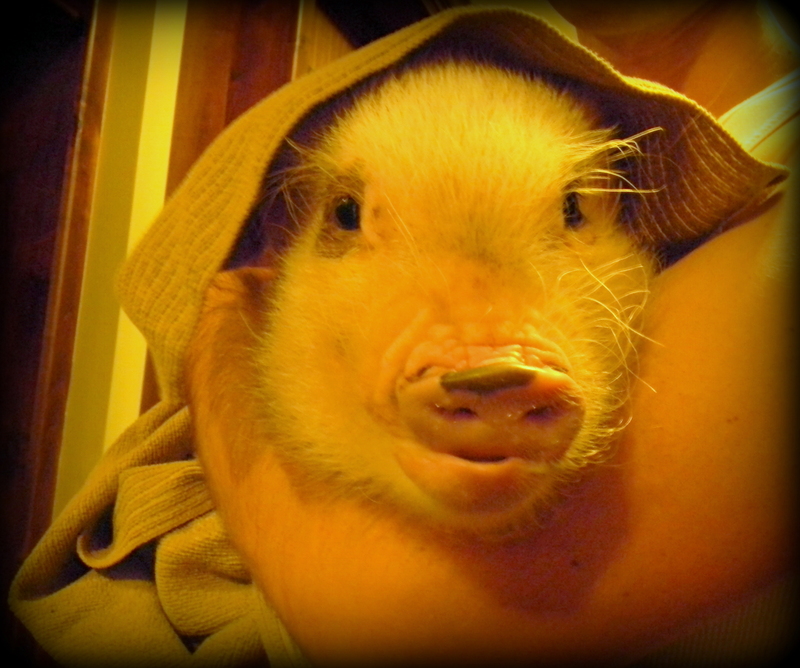 We have 2 (not so mini) pigs that amaze us daily with their love and affection and silliness! It great to read about Oscar’s similarities and differences! Makes my day!! Thank you for taking the time to write such a nice comment! I’m so glad you love Oscar and the blog. He and I have tons of fun working on the site but also hope others enjoy it. It’s especially great when other mini (and not so mini!) pig owners can relate to our experiences. Pigs are such wonderful creatures, and I completely agree about being amazed daily with their love and affection and silliness. This little guy keeps us laughing. 🙂 Thanks again!